The majority of Japanese ivories that are included in our Fine Sales can be divided into netsukes or okimonos. They were carved from a variety of materials such as elephant ivory, walrus tusks, narwhal tusks, sperm whale teeth, hippopotamus and warthog teeth as well as antler and bone. 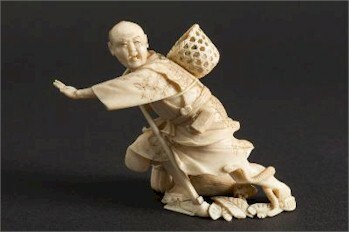 A Japanese Carved Ivory Okimono depicting a peasant being attacked by a snake (FS24/640). Netsukes are carved miniature sculptures in the form of a button or toggle. Traditional Japanese garments had no pockets. However, men needed to store their personal possessions such as money, tobacco, pipe, seals and medicine. To overcome this, containers (sagemono) hung from cords from the robes sashes. The netsuke was tied at one end of the cord to stop the cord from slipping through the sash. The production of netsuke was most popular during the Edo period (1615–1867). The subject matter was diverse and included animals, rats, insects, gods, demons, birds, peasants and plants. 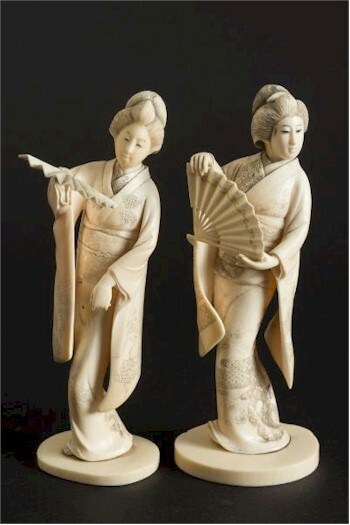 A pair of Japanese Carved Ivory Okimonos of courtesans in traditional costume each holding a fan (FS24/641). Netsukes fell out of favour when Japan opened up her markets to the Western world. One of the influences from the West was on clothing and the traditional Japanese garments gave way to more Western style attire with pockets, so netsukes slowly declined in popularity. The netsuke carvers turned their craftsmanship to the production of okimonos. Okimonos are finely carved ivory or wood figurines that were made as ornaments for the tokonoma, which is a decorative alcove considered as essential in the main hall of a Japanese home. The tokonoma would hold only a few decorative ornaments and were often changed according to the seasons. Often the figures were of deities but often they reflected Japanese life, habits and mythology - they were given pride of place in the tokonoma. The golden period for okimonos was the Meiji period (1868–1912). 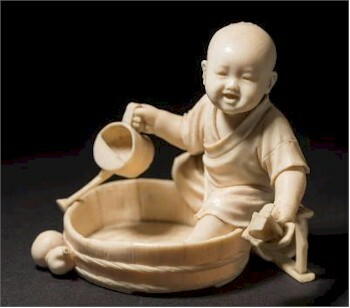 A Japanese Carved Ivory Okimono of a young boy paddling in a wash tub (FS27/562). Okimonos were normally carved from ivory or wood or a mixture of both mediums. The Tokyo School of Carvers is normally synonymous with fine quality and probably point to the pinnacle of okimono carving in the Meiji period. When looking at ivory okimonos, two types are found - one where the figure has been carved from a solid piece of ivory, the other where the figure has been carved in sections that are then glued together using fish glue. Often arms, hands and accoutrements are pegged and glued to a figure. Over time the fish glue dries out and the figures start to fall apart. Central heating can accelerate this process. Solid carved pieces do not suffer quite so badly. A further form of decoration to ivory is shibayama: the art of laying semiprecious stones, coral and shell in relief to ivory.